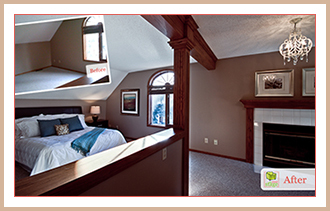 Before Home Staging Empty House: Buyers saw a small empty room. After staging, the property sold within 14 days. Selling a vacant property is one of the most stressful things any seller can put themselves through. Some of the most stunning properties can sit on the market for months, even during a sellers market. Even though no one is living in the property, the utilities, taxes and mortgage still need to be paid. Why are vacant properties so tough to sell? Not only do buyers have difficulty envisioning where they can place their belongings, but vacant spaces seem smaller, cold, empty and life-less. The solution is simple: welcome your buyers in by staging your empty house. The short term investment in home staging is less than a price reduction and it’s listed on HomeGain’s Home Sale Maximizer Guide as the second best return on investment for sellers. Don’t risk confusing buyers with any vacant spaces by upgrading the Promote Your Property Package. Add your Spacious or Cozy Dining Area, Spacious or Cozy Family/Bonus Room, Office, King Bedroom, Queen Bedroom, Twin Bedroom, Bathroom or Laundry Room.